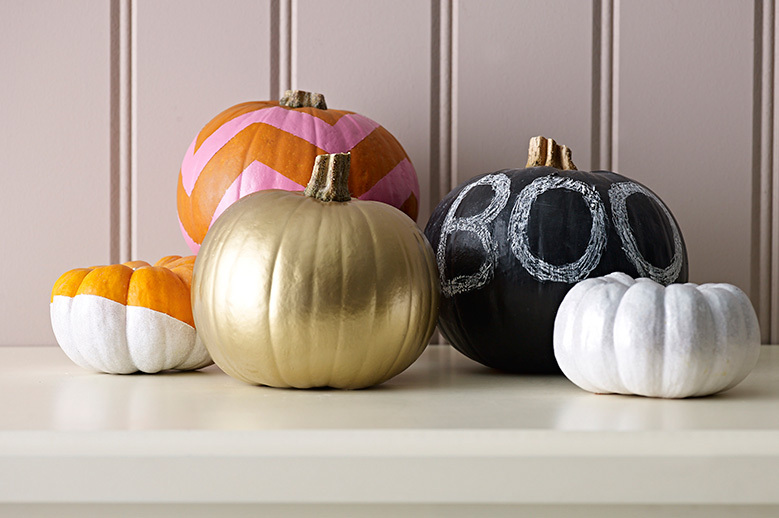 Painted pumpkins are a really funky new trend that we’re seeing everywhere this Autumn! We couldn’t resist having a go, so we’re bringing you a ‘how-to’ with a few different looks to have a go at at home. Whichever you try, make sure you prep your pumpkin before you start, giving it a good wipe down with a wet cloth (though you should avoid wetting the stem and bottom as this can cause your pumpkin to rot). Dry thoroughly with a clean towel, making sure you’ve gotten rid of any dirt or debris – then you’re ready to start. Chalkboard paint really lends itself to this trend. Not only is it black and spooky, it provides the perfect canvas for all manner of Halloween messages. 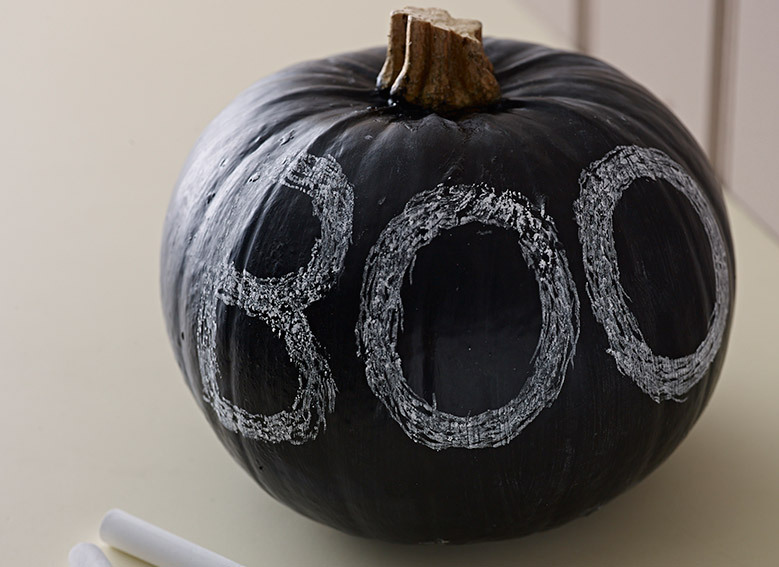 Use your chalkboard pumpkin to count down the days until Halloween, pick a big pumpkin to scribble your monstrous menu on or keep it simple with a shorter message (like ours). 1. Make sure you cover your work space with plenty of newspaper, dust-sheets or spare cardboard to protect not just the surface underneath but your carpet or flooring, too. It might also be a good idea to wear some old clothes – just in case of splashing. 2. 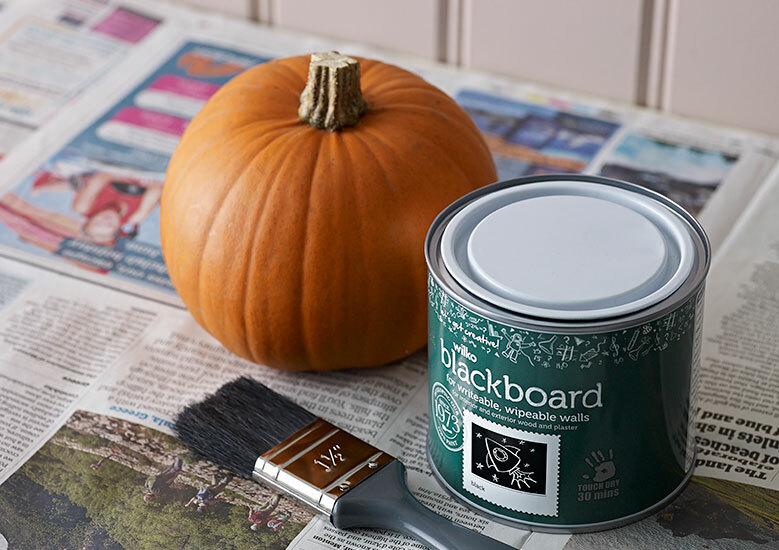 Apply a single coat of blackboard paint, using a brush appropriate to the size of your pumpkin. If you’re not painting the stem, make sure you mask this off and use a smaller brush to ‘cut-in’; getting right into the creases and painting a bit of the surrounding area so you don’t accidentally catch the stem with your thicker brush. Don’t worry too much if there are still bits of orange showing through. 3. Following the instructions on the tin, allow plenty of time for your first coat to dry. Chalkboard paint will dry from a shiny to lovely matt finish, which will give you an indication. Once it’s dry to the touch, add a second coat to catch the bits you missed first time, then leave to dry overnight. 4.The next day, check your pumpkin, making sure you’re happy with the coverage and finish. If not – add another coat and repeat. If you’re happy, it’s time to write your Halloween message! If you’re displaying your pumpkin by the door, why not write ‘Enter if you dare!’ or ‘Trick or Treat!’? We kept it simple and went for ‘BOO’ (see main image) – the rounded letters look great on the pumpkin’s curved surface. Who says pumpkins have to be scary? Chevrons have been big for a few years, and we don’t think they’re going anywhere yet. 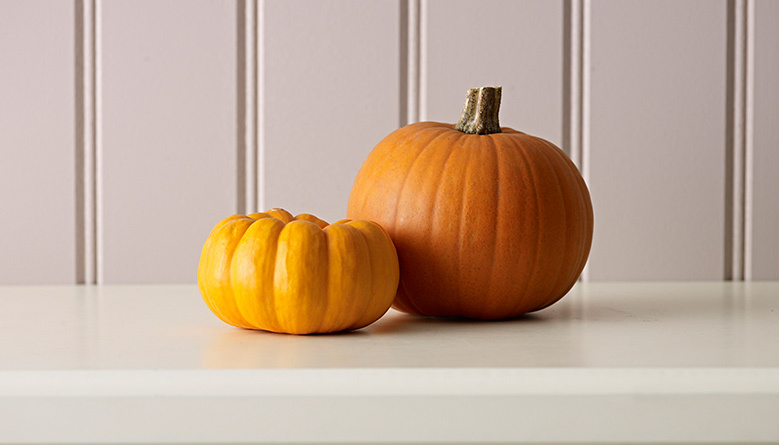 These asymmetric designs are absolutely perfect for an autumn table centrepiece and look lovely on even the tiniest pumpkin. All you need is a bit of masking tape and a couple of complementary shades of paint. 1. 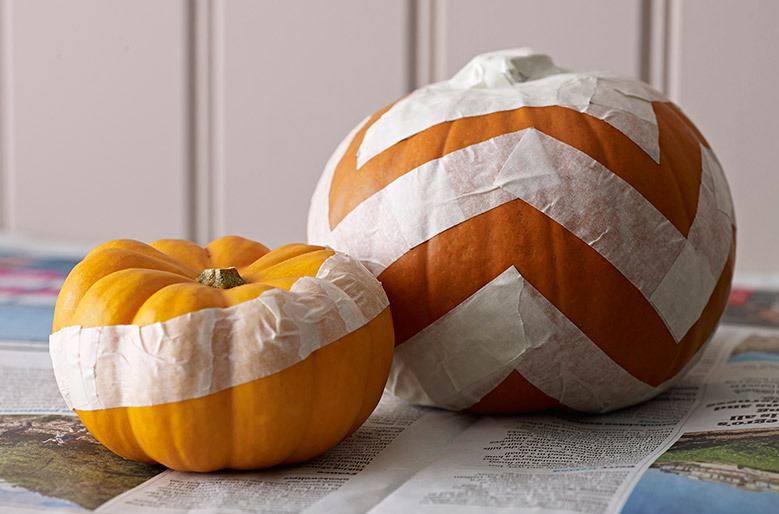 Once your pumpkin is clean and dry, grab the masking tape and a pair of scissors. Don’t be afraid to get this bit wrong as, due to the pumpkin’s curved surface, it’s not easy to get the pattern right first time and you might need to do some tweaking. Starting at the widest part of the pumpkin, use your masking tape to mark out the pattern you’ve chosen. If it’s chevrons; make a zigzag pattern, overlapping each piece of tape to form a sharp point. If it’s asymmetric; tape a diagonal line all the way around. 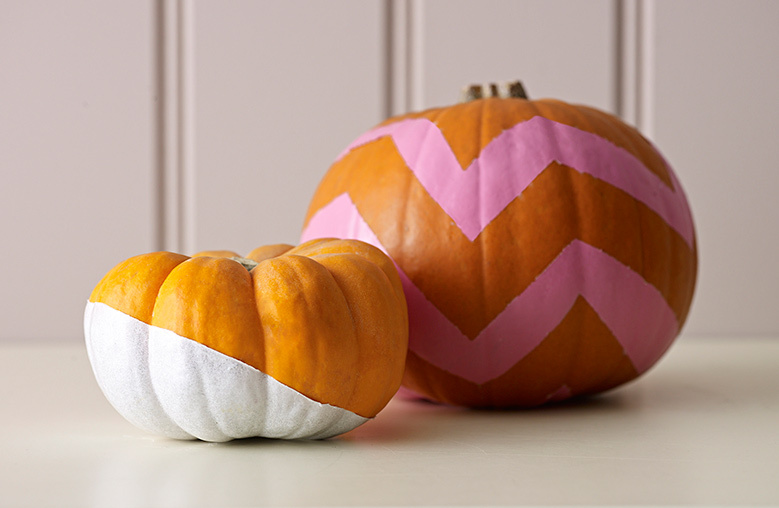 Make sure you smooth your tape into the grooves of the pumpkin to stop any paint from running down the creases. Make it as neat or as messy as you like – it is Halloween, after all! 2. Depending on how long you want your pumpkin to last, you might want to add a coat of primer first. This will not only help the paint adhere to the surface, it’ll also help combat the ‘orangeness’ of the pumpkin and stop it showing through your colour. 3. Next, choose a colour that’s going to look nice with orange – perhaps something that matches your existing colour scheme? Following the instructions on the tin, paint a nice even coat, carefully removing the tape while the paint is still wet to prevent pulling it off (be especially careful of this if you’re using a quick drying spray paint). For extra embellishment, add a coat of glitter. 4. Leave to dry and don’t forget to show off your masterpiece. Why not coordinate it with other pumpkins for a really striking display? 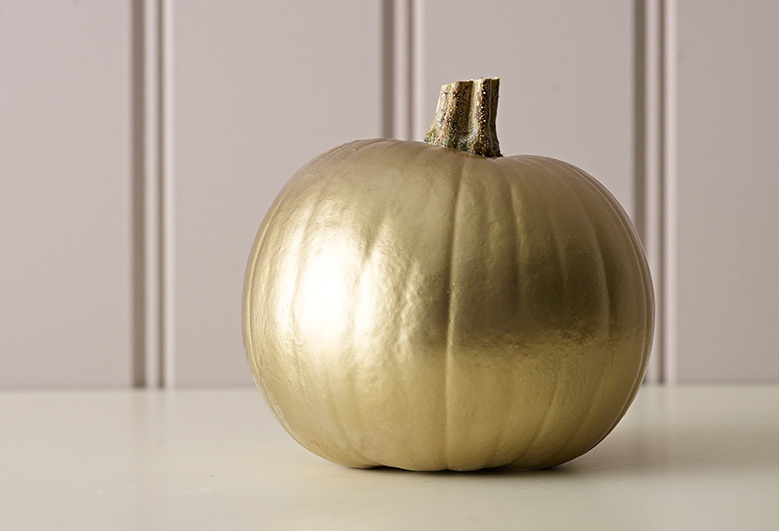 A gorgeous gold pumpkin adds a touch of luxury to any autumnal home. The perfect decoration for a more grown-up Halloween celebration, there’s just something about golden pumpkins that we really love – and they look beautiful paired with chalkboard pumpkins, too. For this one, we used a fast drying spray paint to give the pumpkin a really smooth, shiny finish. If you’re spray painting, just remember to tape over the stem so you don’t have to worry about catching it by accident! You should also make sure you spray your pumpkin in a well ventilated area and follow the instructions on the can, reading them thoroughly before you start. What do you think to our hard work? Come and share your own pumpkin pics with us on our Facebook or Twitter – we can’t wait to see what you’ve done!